It really did take ages for some songs from overseas to become successful in Australia in the '80s. For starters, there was no such thing as New Music Friday - the current global release date for new music. Local release dates could be months after a song came out overseas. Also, new artists often took a while to catch on here, with radio and TV sometimes reluctant to champion unknown acts. This week in 1987, a new group's debut single, which had been a top 5 hit in the UK in November 1986, finally entered the ARIA top 50 after a 12-week climb up the top 100. It wouldn't reach its ultimate peak here until the final week of July. 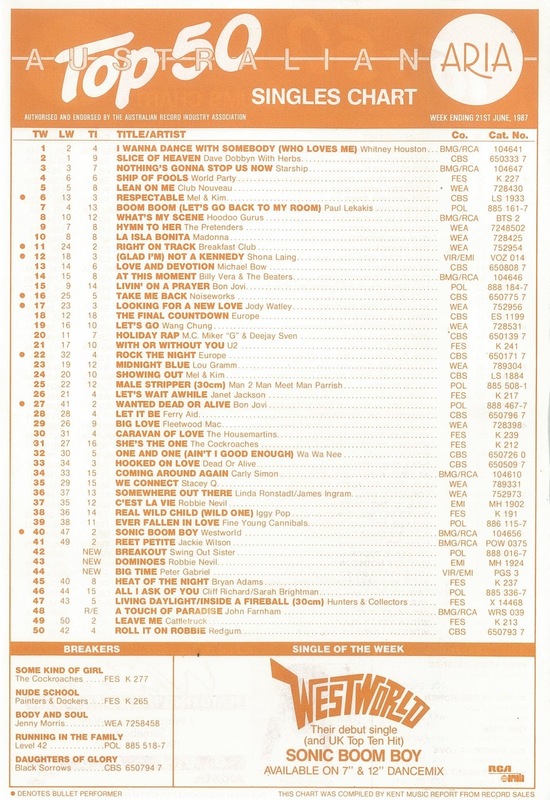 A song that had become an immediate hit took its final step up the chart this week in 1987. 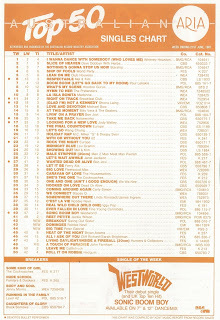 "I Wanna Dance With Somebody (Who Loves Me)" by Whitney Houston moved into the number 1 position for the first in a five-week run. This second single by the Brisbane-based pop band was released on Powderworks, who'd released Midnight Oil and Allniters' early records. Unfortunately for The Technicians, they weren't as successful and then the label went into liquidation shortly after. The new project for ex-Belle Star Jennie Matthias (alongside guitarist Melissa Ritter), DLAM got their Janet Jackson-ish pop/funk courtesy of US producers Preston Glass and Randy Jackson - and aped Robert Palmer in the music video. It was a case of one step forwards, two steps back for Jenny Morris, who followed up her first ever top 50 hit with a chart disappointment for the title track of her upcoming debut album. Luckily for Jenny, the Body And Soul album was better received than this self-penned single, with the LP reaching its number 13 peak in September - the same position achieved by its biggest hit, "You I Know". It'd done the trick for the lead single from So and an animated video once again worked a treat for the album's fourth release, "Big Time", which quickly became a music TV favourite. A song about the quest for success, "Big Time" wasn't that, er, big a hit in Australia, but it did spur the album back up the chart for another stint inside the top 10. This would be the last we'd see of Peter on the singles chart for five years, when he returned with the lead single from Us - and its animated music video. Like Europe's "Rock The Night", this second chart hit for Robbie Nevil has always been a favourite of mine despite being completely overshadowed by its predecessor, "C'est La Vie", which was still inside the top 40 this week. Another catchy pop/funk track, "Dominoes" would be the final hit from Robbie's self-titled debut album and he wouldn't return to the ARIA chart until 1991, when his third album, Day 1, yielded a single to rival the success of "C'est La Vie". Here's the song that took forever to find its way into the Australian top 50 - after weeks hovering around the 50s and 60s, Swing Out Sister's breakthrough single finally gained enough momentum to make some serious headway up the chart. A joyful burst of sophisti-pop, "Breakout" teamed singer (and fashion designer) Corinne Drewery's resonant vocals with a buoyant horn-drenched track on one of the year's best songs. Unfortunately, despite other great tracks on debut album It's Better To Travel like "Fooled By A Smile" and "Twilight World", and 1989's excellent "You On My Mind", this would be SOS's only top 50 appearance in Australia. I'm not sure why the black and white version of the music video (below) has been chosen over the colour one for the band's Vevo channel - it just doesn't have the same impact, especially at the all-important key change/fashion show reveal towards the end. Next week: we reach the end of the first half of 1987 with eight new entries, including the more succesful of two rival cover versions of the same song and the long-awaited (for me) top 50 debut of a British band I was quite a fan of. I was expecting The Technicians to be a pub rock act with that band name. What became of Powderworks? I had never heard of the label until seeing all of Depeche Mode's early singles were released in Australian on it. The wikipedia page doesn't enlighten much. I didn't know the Dance Like a Mother track until a rage airing a few years ago. Pity they don't get the credit Shania does for reversing the roles of the 'Addicted to Love' video. 'Body and Soul' is a bit underwhelming compared to Jenny's adjacent single releases. I wonder why there was such a long gap between 'You're Gonna Get Hurt' and this. 'Big Time' is a song that is not as good as my memory of it is. When I bought a Peter Gabriel best of in the early 00s, I was looking forward to hearing 'Big Time' again, and then when it got to the track I was waiting for a big chorus to come that never arrived. I didn't know 'Dominoes', but a subsequent single from the album, which I found on a video tape, 'Wot's It To Ya', is quite good. 'Breakout' was released locally in mid-February 1987. I could swear I caught it on Cartoon Connection around March '87, so it's strange it took a few months after that to reach the top 50. The video virtually looks like an ad for Spotlight. Re Powderworks, Discogs has more info about it going into liquidation. PS It's a shame Vevo have uploaded the monochrome version of 'Breakout'. There is a (mostly) in-colour version which better suits its jauntiness. Yep, that's the one I linked to within the blurb. I didn't even realise they'd made a non-colour one.